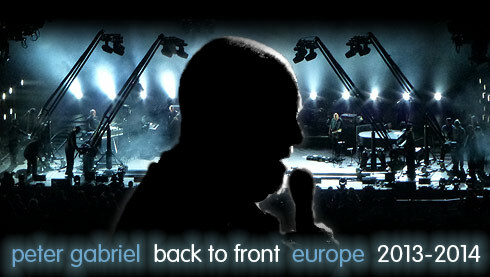 After a selection of short tours with the New Blood Orchestra within the last 2,5 years, Peter Gabriel returned on stage again with a full band, celebrating the 25th anniversary of So. Gabriel reunited with his old bandmates of 1987. We have collected a couple of youtube-shots from the 2012 shows. If you're interested, have a look at our Back To Front youtube page. UPDATE: Fourth leg announced for fall/winter 2014! All North American shows are available officially as 2CDs and USB-sticks (recorded from the soundboard) at TheMusic.com! All European Shows just as 2CDs, but all customers will receive a high quality download once the shows are available. Click here for more information. We are happy to present a show-by-show review of the 2013 Encore Series. Once a new show becomes available, it will be reviewed and the specific show will be added on our review page. The new Encore Series 2013 review page went online 27th October 2013 with impressions from Herning and Amsterdam Encores. We hope you enjoy it! 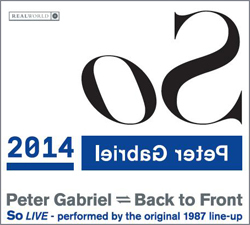 As expected, all shows of the 2014 spring tour will also be released on 2CD as part of the new Encore Series. More information and pre-order options can be found on Peter's website. NEW: Peter Gabriel's former drummer, Jerry Marotta, brings back memories of the very first Peter Gabriel tours with his tribute band The Security Project. Tour dates for Europe 2015 have just been announced! Follow this link for more information. * Review of these four shows here.